A quick 5 Step Guide on how retailers should handle their social media pages around the festive season. Everybody (excluding the grinch) loves Christmas. This fact alone makes for a brilliant opportunity to engage with your customers and as you may know, customer engagement is key. As for most retailers, this is also the busiest few weeks of the year and I hope by using this guide you could make it the busiest ever. Step 1: Don’t be late to the party. Start early: all the top retailers will. The sooner you begin creating that festive buzz the more time you have to build it. Step 2: Create a festive image. Get creative; change profile pictures, cover photos, website themes. This will capture the christmassy feel perfectly and customers will warm to this. However, if you’re anything like myself and graphic design is a concept that is simply lost on you then don’t fret: there are plenty of cheap sites with brilliant seasonal stock photos e.g. Fotolia or Stockvault. Step 3: Identify your campaigns. It’s christmas so be generous! This means giveaways, competitions and discounts. this creates relationships with customers and makes them feel more valued. Giveaways in particular are a fantastic way to build a buzz and increase exposure for your product. Have your customers share your product for a chance to win it; this will get others involved and attract new potential customers. A brilliant example of a Christmas ad campaign is Micromax Mobile’s #CanGiftHappiness. To summarise, Micromax promised to donate .1 Rupees to charity CRY, India for every tweet made using the hashtag. 29.5 million impressions later they raised 469,664(INR) which converts to just under 5 grand GBP. As well as contributing to a great cause they gained masses of publicity for the company with press articles being made on the campaign afterwards. Step 4: Create your own Christmas hashtag. Bring your customers together. 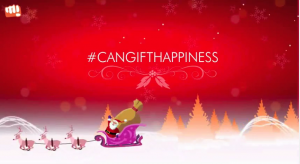 It doesn’t have to be as extreme as #CanGiftHappiness, however any hashtag you can use to bring your customers and followers together will only be beneficial. Use hashtags to get followers to share photos, stories and opinions; Engagement is always good. Step 5: Track and analyse the success of your campaigns. Some campaigns will be more successful than others, this is to be suspected. But by using twitter analytics or facebook insights you can track how successful individual methods are. This gives you the ability to push the more effective campaigns. If you are to follow these steps I suspect you will find your company will reap the rewards. If you would like more advice on how to improve online sales, or help with your social media, make sure you get in touch. Merry Christmas. Previous PostCould ‘Facebook at Work’ make LinkedIn obsolete? Next PostIs Facebook Advertising Actually Beneficial?